Cannon associates from the New York office including Heather Clinger, who served as interior designer on the project, along with architects from Cannon’s Baltimore location, comprised the design team. Ms. Clinger explained the crucial need for thoughtful design in a patient care environment where patients and their caregivers will visit up to 100 times during the course of treatment. “We looked to patient advisory teams to inform this process. 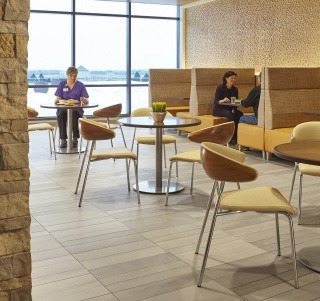 ProHealth had a very strong patient group that especially focused on the infusion center; they wanted it to be more open and more social, with areas to stop and rest. Also having things contiguous and sequence-based, with a level of discovery and surprise so the newness factor won’t wear off.” They also consulted with a “Whole Person Health Design Team” comprised of ProHealth Care staffers. 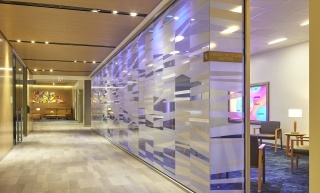 One solution for rest and social areas was Cannon’s integration of fireplaces, with feature walls of Mosa tile. Says Ms. Clinger, “They wanted a place to gather and as they were there more often it created a welcoming atmosphere.” Cold Wisconsin winters also called for a warm approach. 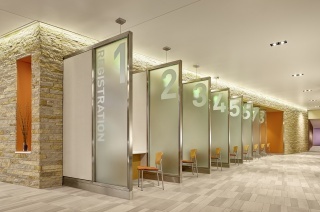 As patients will revisit the facility dozens of times, the designers chose interesting materials that vary by time of day and angle of view. 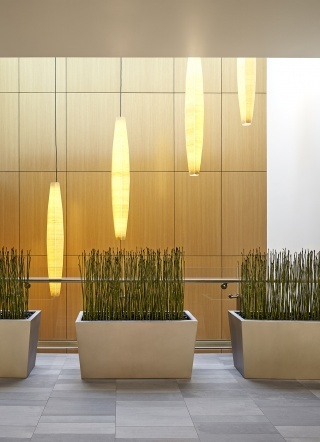 Mosa’s Terra Tones, with varying shades and depths helped create this dynamic, the color of the product imitated the light change, adding to the dimensionality. Within a palette chosen to reflect the natural landscape surrounding the facility, Cannon wanted an engaging, organic look. Mosa tiles helped them achieve it because the tile changes even within the pattern. No two are alike. Cannon needed flooring that could hold up to the salt-heavy Wisconsin winters and be smooth under daily wheelchair use. Mosa’s precise face dimension and rectified edges allowed for smoothness and minimal grout joints, and above-standard slip resistance rendered everything safe. Ms. Clinger says regardless of the project, “Cannon always starts from a sustainable story – we always start the conversation with the client surrounding this topic.” Mosa is the first and only C2C certified porcelain tile. 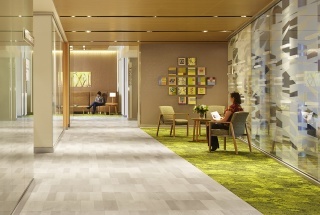 “Of course that will impact our choice,” says the designer, who also chose other finish brands with sustainability including Interface for carpeted areas.